On previous occasions on this site, I’ve commented (regarding the Green Blobbies) that ‘you couldn’t make it up’. Well, it looks as if they just did – and certainly not for the first time! That #**n BBC is milking the story again this now !!!! A good, punchy letter making its points with great clarity and authorised by four very respected contributors to the ‘Real Climate Change Debate’. They will be circling the wagons. Damian Carrington wrote a piece in yesterday’s Graun “Plummeting insect numbers ‘threaten collapse of nature'”, mentioning his previous article which mentioned the Puerto Rico study. If only all insects are as intelligent and adaptable as mosquitos & ticks. Apparently those nasty little buggers, spurred on by climate change, being disease-bearing insects are spreading to ever-wider parts of the world. Reading the Guardian comments, there are some seriously disturbed people on there. 1. Those who cheer on any possibility of a mass extinction of mankind. 2. those wetting themselves over a fraction of a degree of manmade warming. Neither group seems to have the facility to understand basic facts. The sky will fall in tomorrow. 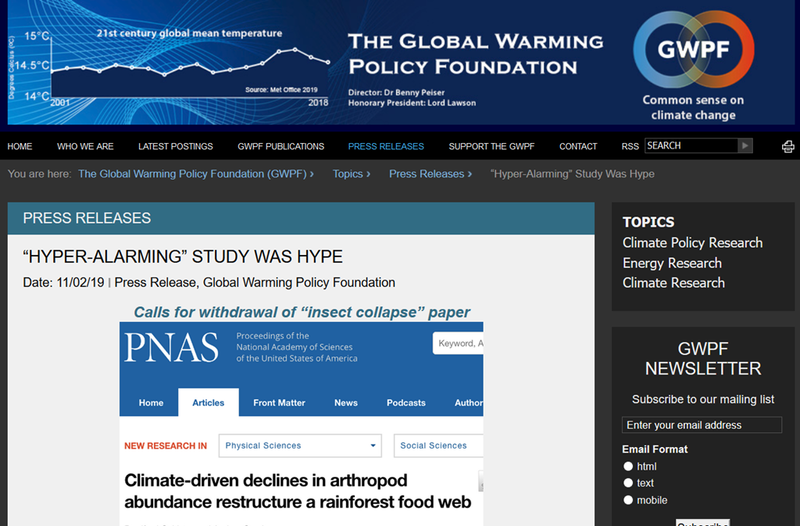 So that PNAS paper is different from the Sydney Uni REVIEW paper that is getting big PR today. I expect that Sydney paper partially used the PNAS paper’s data ? A few years back we were warned that the earthward population would be decimated due to flatworms from New Zealand and that this would have incalculable effects on agriculture. nothing seems to have happened. I guess they have migrated back to New Zealand, probably because of climate change. Do we get a retraction from the alarming BBC? Not on your life. 1] If they’re blaming insect depopulations on rising temperatures, yet local temperatures are known to have declined since 1992, this is simply a fabulation. 2] Given that the IPCC’s estimate for rising temperatures is 1.5º in the last 120 years or so, are they seriously claiming this threatens the survival of all insect populations? Insects have proven pretty adept at adjusting to slowly changing temperatures over time but far more so when it gets warmer. What would threaten their survival more is a decreasing temperature. The colder it becomes, the fewer would survive. Conclusion – Messrs Lister & Garcia are either unfamiliar with the subject matter or are simply buttering their bread. Just wait for the next wasp, greenfly, slug, ladybird, mosquito, beetle, and any other summer insect upward (natural) variation in infestation, and it too will be blamed on cAGW aka ‘Climate Change™’.